A three-year-old is stomping her foot, refusing to go home. Although a regular scene, everyone who is waiting for the elevator stares at them as she is throwing a temper tantrum and her mother’s at a loss! Have you found yourself in a similar situation? Most parents do. A temper tantrum is like boiling milk—one minute it’s boiling over and the minute you simmer the heat, it stops. As parents, our job is to be the pacifiers and supporters during this emotionally confusing phase of our little ones. And as always, a little patience will do the job! 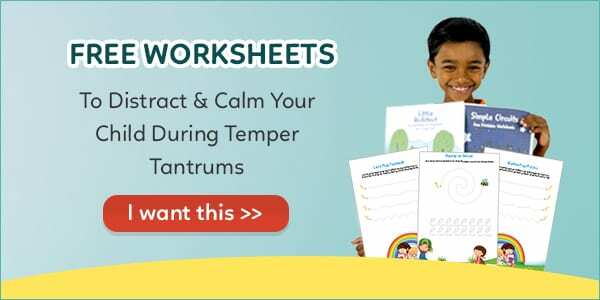 With the expert opinion of Dr. Dhaani, we bring you 5 sure-fire hacks to help manage your child’s temper tantrums. 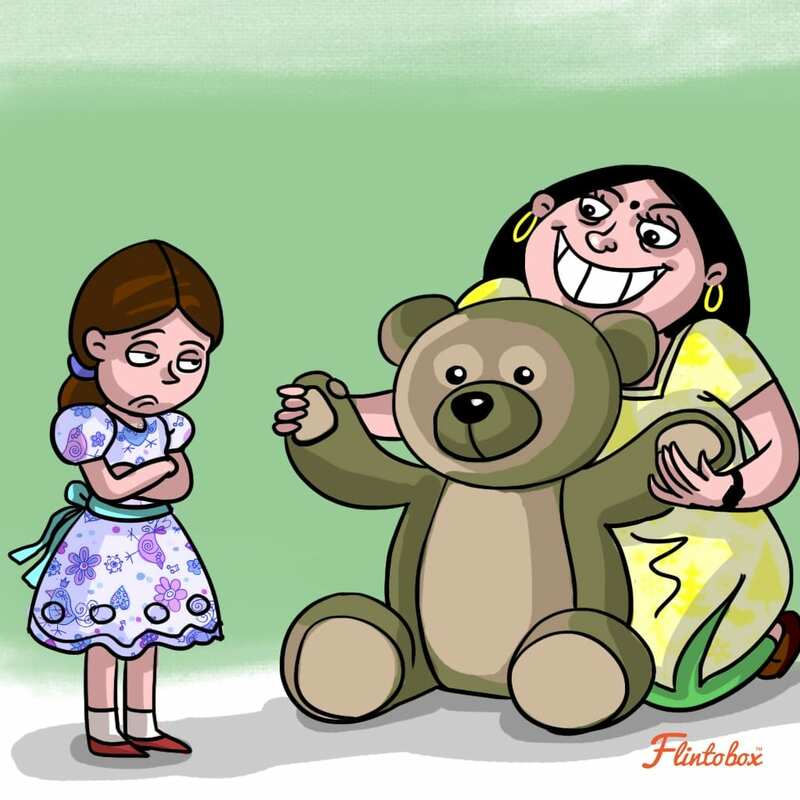 Dr. Dhaani asserts that tantrums are neither the child’s nor the parent’s fault. They’re just a basic part of growing up and should be tackled as naturally as possible. Children cannot express emotions through language and when ‘normal’ things seem ‘abnormal’ to them, they react. Although no one can be blamed for temper tantrums, bad parenting can create scenarios that cause these tantrums. 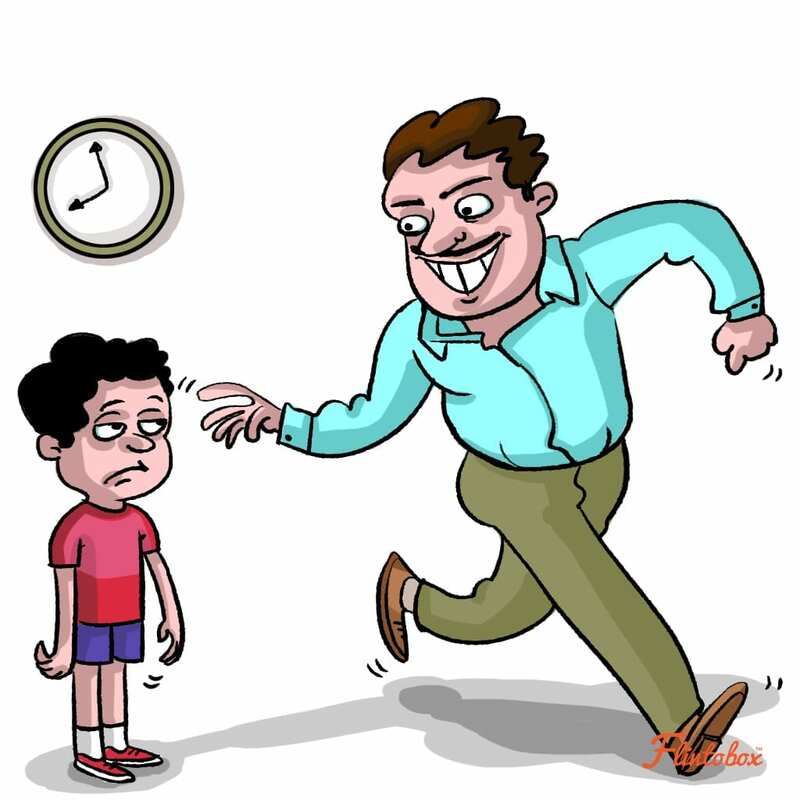 In Dr. Dhaani’s words, “Harrowed parents make for harrowed children!” She also says that disruptions amongst family members or tension between parents also lead to a lot of temper tantrums in children. Unknowingly, it was my first lesson to teach him to separate the act from the person. “All children are good, irrespective of terrible tantrums,” says Dr. Dhaani. 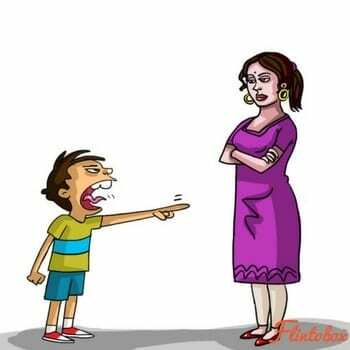 She refers to a common mistake made by most parents – generic name-calling (“bad boy/girl”) due to tantrums. “If a wrong act makes the entire person wrong, we are all extremely bad people since all of us have done wrong things at some point or another, no?” Dr. Dhaani leaves us with this question and we all have the answer. Right? “That! That!” In the food section of a departmental store, I heard a small child shout out these words. Her mother looked confused (to say the least) since the child was unable to explain what exactly she wanted from a shelf at which she was constantly pointing. Soon, she was wailing while her exasperated mother hurriedly pushed the shopping cart out of the aisle. Ever been in a similar situation? “Tantrums can be due to restricted language ability. Since children cannot express their anxiety through words, they resort to physical action, crying, or what we call tantrums,” explains Dr. Dhaani. Assessing the above-mentioned situation, Dr. Dhaani concludes that the child threw a fit not because her demands weren’t met, but because her mother was unable to understand what she wanted. “After a temper tantrum, explain to your child that his/her behaviour could have been avoided if such and such words were used,” she says. “Slowly, as communication improves, tantrums will reduce,” she adds. Dr. Dhaani says that when we don’t stop a person from saying ‘ouch!’ when they’re hurt, we should also not stop a child from reacting when they are not able to mentally decipher a situation. The best way to react to a temper tantrum is to keep calm, quietly disagree with your child’s behaviour and allow them to relax. When to give up during tantrums? “Don’t push your child for things that are flexible,” says Dr. Dhaani in an I-really-mean-it tone. 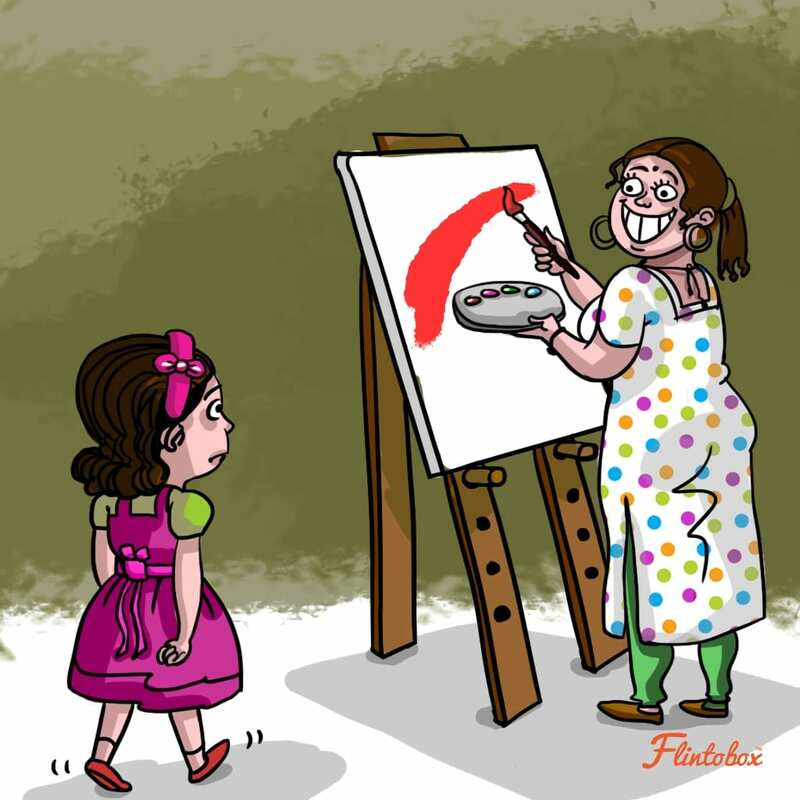 She believes that there are endless things for which parents can be more flexible, but in reality, are not. A temper tantrum for watching TV for an added 10 minutes is acceptable, especially if it’s a holiday or the child is really enjoying the show. However, once an extended deadline is given, it is not negotiable, tantrum or no tantrum. But tantrums for things like brushing teeth or going to school should not be accepted and parents should hold their post at all cost. When we disregard requests or expose children to their favourite things and then deny them enjoyment, tantrums follow. Even after planning beforehand, if tantrums follow, they should be tackled through negotiation. It is important to remember that misbehaving in public places is unacceptable, but so is scolding or embarrassing the child in public. Amid a tantrum at a public place, try and make eye contact with your child and convey the idea that you are not liking his/her behaviour. Later at home, discuss the situation and mention the severity of such improper behaviour. 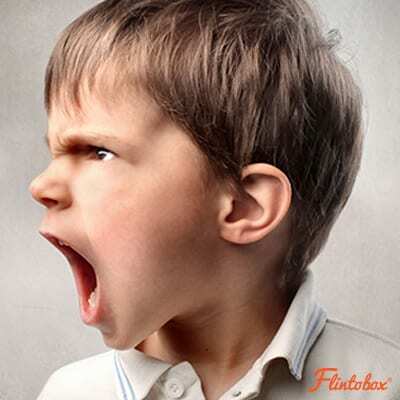 “More often than not, it’s the stomach that needs attention.” Hungry children make angry children! 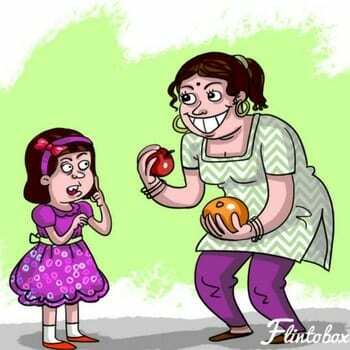 Make sure that your child is not on an empty stomach before you start scolding or explaining to them. Children cannot manage hunger and emotions at the same time which is why sometimes, tantrums occur. A full tummy will ease their anger even if not totally eliminate it. 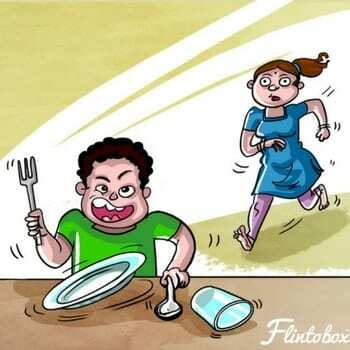 Every parent must know when to loosen the thread and when to tighten the screws when it comes to hunger tantrums. When a kid throws a tantrum for not eating rice/chapati second day in a row, it is acceptable since we have various food options and it’s not worth fighting for. The same logic applies to all the healthy food that we are trying to push. “Giving children a few choices makes them feel in control and it’s easier to manage them that way,” says Maya, a mother of two. “You will notice that tantrums happen first thing in the morning or immediately after school,” explains Dr. Dhaani. The reason is that during these times children are hungry. The easiest way to make your child stop throwing a tantrum is to distract or grab their attention by doing something else and make them forget the reason why they are behaving that way. 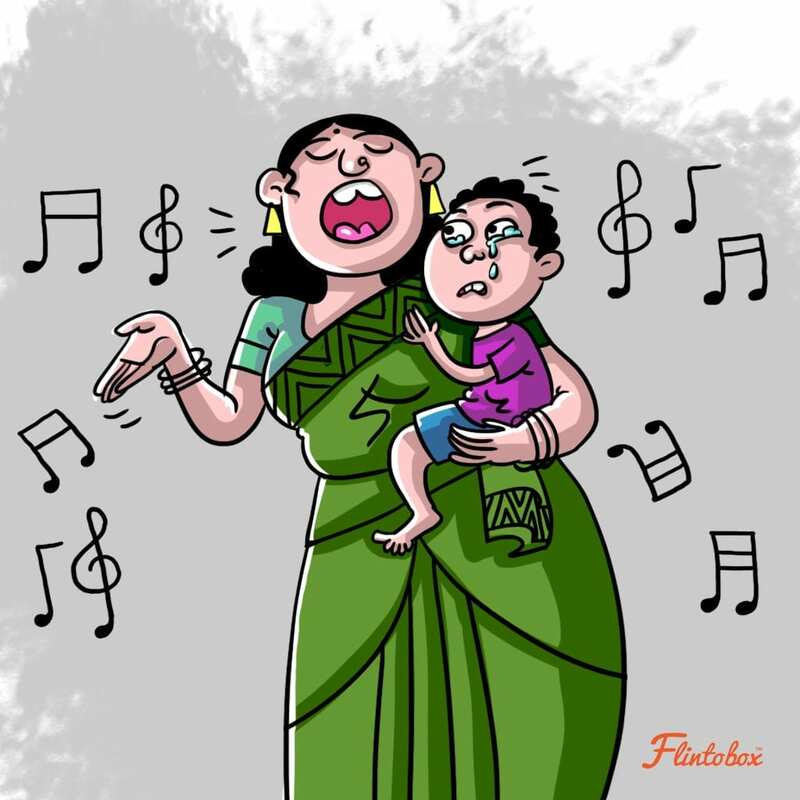 Singing silly songs when children are angry can help ease them out. You don’t need to sing per se, but just distract them with funny noises. Grunting like an animal, singing a rhyme, or even singing a prayer can do the trick. They cannot resist funny noises and immediately the mood shifts from anger to playfulness. Singing along with pretend play can help parents distract their angry child and make them forget their tantrums. This can work out better than mid-tantrum scoldings, especially in public places. Bring out your child’s favourite toy and start playing with it. This will work best with preschoolers at home. Children dislike sharing their toys. 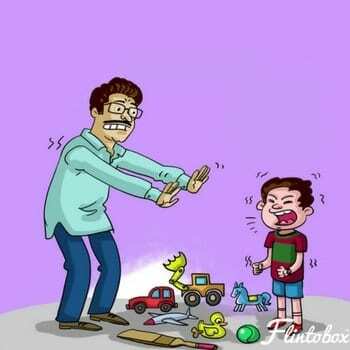 Even if your child doesn’t, he/she must have a favourite toy that gets all the attention. In a mid-tantrum crisis, you can start playing with it. 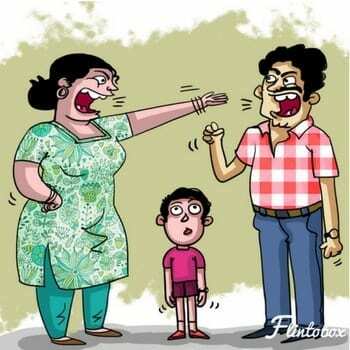 Slowly you will get your child’s attention and the temper will be forgotten. If the child joins you, allow that. Play for sometime before moving on to your work. Crisis averted! This technique has proved its worth in gold since the time we were kids. Try it! “Most of our best paintings have been made when I was trying to distract Nimish,” says mom Hasmita. She’s showing me her son’s art book. “I offer him my time when he throws a tantrum, but never give in to his threats,” she continues. She keeps a huge collection of craft items—glitter, glue sticks, paints, colour papers, and so on. “The internet is full of ideas you know!” she adds-in a tone that says that she has enough ideas to last her a lifetime of tantrums. Tantrums are nothing but misdirected energies of a child due to hunger or because the body needs something better to do. Exercising releases endorphins. These hormones trigger a positive feeling in the body which is what a child needs when he/she is throwing a tantrum. Playing catch-up and running is a fun way of exercising–a good way to release anger. “I quickly show him and then hide it behind me,” explains an animated Ritu. She’s explaining her tantrum-distracting activity and seems quite sure of it. Ritu says that children’s span of attention is quite short. It’s impossible to think of new ideas every few hours for an ever-active child like hers. Besides, his tantrums never cease. Since there is no dearth of things in the house, she has started using them for play. She chooses safe objects like spoons (read utensils), pens, water bottles, and so on for her trick. She quickly shows and then hides them behind her back. “Tell me what it is?” she asks. The happiness with which her son responds cannot be expressed in words. “He hardly ever misses the correct answer and hardly ever remembers his tantrum,” she winks! Tantrums are a common feature amongst every toddler. However, you must be vigilant and check if tantrums spring from psychological anger issues or not. If you have disagreements or arguments in front of a toddler, Dr. Dhaani suggests that you must immediately stop. A very stressful work life of parents also leads to added stress in a toddler’s life. Tantrums can spring from this stress too. Keep a notebook where you record the tantrum triggers and if you feel there is a set pattern in the tantrums, seek the help of your doctor. 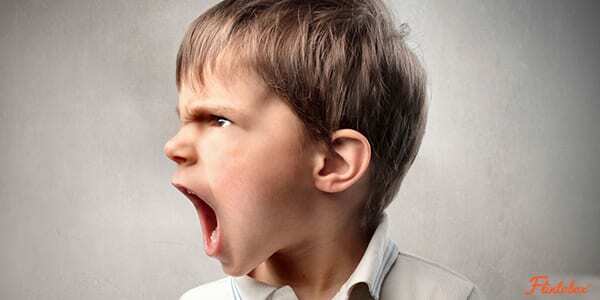 So, what do you do when your child throws a temper tantrum? Share your ideas and favourite activities in the ‘Comments’ section below along with your views on handling toddler temper tantrums with us. Comment below. Thanks a lot, Ashwini! Glad they were helpful 🙂 We’ll try to add more! Excellent ideas and clues. Will surely help. 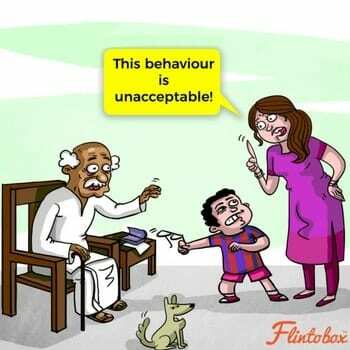 How to deal with angry child ? Thanks Amrita for such a nice article. This is really helpful for me. First rule is dont get angry when your kid is dealing with anger. Sing a song, act like a joker.. Thanks flintobox . It’s really work for me ..article is very appreciating looking forward for more . My son loves hide Nd seek so we play hide Nd seek when my son throws a tantrum. But in public places we surely enjoy alot by playing with him shopping shopping and finally we endup with a smiling son back home.